Culture » Big Shiny Robot! Now that the first trailer has come out for Marvel’s summer film version of Guardians of the Galaxy, I’m getting asked quite often what it’s all about, and how in the world it ties into the broader Marvel Cinematic Universe. I also keep getting asked what comics people should be reading to get themselves pumped up and knowledgeable for the summer movie season. The first thing you ought to know is that the Guardians of the Galaxy are a team of misfits and murderers who take it upon themselves to protect the galaxy from Thanos. Who’s Thanos? He’s the big purple bad guy revealed in the mid-credits sequence of Marvel’s 2012 smash hit The Avengers. Thanos is the sort of bad guy who doesn’t just go after a city, or a country, or even just a planet. Thanos wouldn’t stop at wiping out half of the life in the known universe and taking over the other half if it meant that he’d win the heart of Death. That’s what makes the casual mention at the end of The Avengers that to challenge Earth “is to court Death” twice as chilling. Thanos gains his powers through the Infinity stones, which were the sources of power for evil energy in 2013’s Thor: The Dark World and 2011’s Captain America. With Marvel playing a long game toward Thanos, it makes perfect sense that they’d introduce the team tailor-made to take him down, even if we won’t be seeing that play out in this year’s film. The showdown with Thanos, if my guess is correct, will happen much later down the line—either in a third Avengers picture, or a film dedicated to the villain known as The Mad Titan. The Guardians of the Galaxy aren’t your normal super-hero group. It’s made up of a giant tree, a talking raccoon, the assassin daughter of Thanos, a bruiser seeking revenge, and a “legendary” outlaw. It’s a group of screw-ups, vengeance-seeking murderers and laboratory experiments, doing the best they can with what they have. The trailer gave a great taste of what you can expect from them. Now that we’re up to speed, the question is what to read. 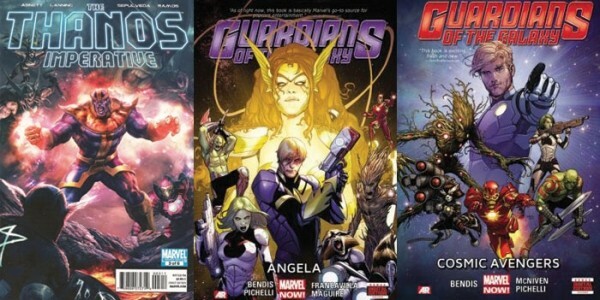 The first thing you’re going to want to read is Guardians of the Galaxy Volume 1: Cosmic Avengers and Volume 2: Angela, written by Brian Michael Bendis and drawn by Steve McNiven. It’s the brand-new relaunch of Guardians of the Galaxy designed to catch people up on the essence of the team. And since you can snag that first hardcover for less than $20, it makes it the right place to start. After you’ve read those—and added the forthcoming issues to your hold—you’ll want to check out The Thanos Imperative from Dan Abnett and Andy Lanning. It tells the story of a tear in the fabric of the Marvel Universe, and only the Guardians of the Galaxy can fix things up. It’s thrilling and funny—just how this team is supposed to be. And if you really want to go deep, you’ll have to read the first appearances of Groot and Rocket Raccoon, all collected in the Rocket Racoon & Groot Complete Collection. They’re about the most absurd and adorable pair of characters you’ll ever read about. And yes, that raccoon will murder you. In the face. Don’t believe me? Marvel’s so confident in Rocket Raccoon that he’s getting his own stand-alone ongoing comic in July. It seems as though Marvel has really pulled the stops out on building up these characters, all for the film that comes out in August. See it. Read it. Love it.